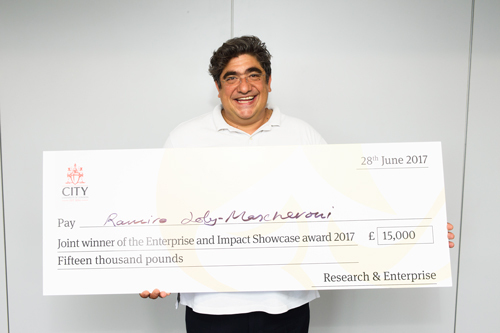 Two academic projects to improve the birth and early development of babies have been awarded £15,000 prizes at the inaugural Enterprise Impact Showcase 2017. The event showcased the research diversity and excellence from across City, focusing on projects with commercial benefit or real-world impact. Eight finalists were chosen to present their work to a panel of expert judges. Ramiro Joly-Mascheroni’s project to create a silicon model of a mother’s face was named as the first winner and a breech birth training course developed by Shawn Walker was chosen as the second winner. Two runners up also took home £1000 each. The prize funds will be used to develop these projects further. Ramiro Joly-Mascheroni is a research student from the Department of Psychology in the School of Arts and Social Sciences. He was picked as the first winner for his project titled ‘soft mums for premature babies’. The project addressed the growing need to support the early development of premature babies who spend their first weeks and months in an incubator. An estimated 154 million babies are born prematurely every year and many of these are born blind or with severe sight loss. Premature babies then spend an average of 21 days inside an incubator, often for at least four months. These months are crucial for development and are the prime time for the babies to improve their underdeveloped visual systems. Many studies have shown the importance of being exposed to human features; babies find human faces, soothing, particularly the face of their mother. Ramiro’s project focused on creating a tool to improve the parental social contact with the new-born. He did this by developing a method to produce a 3D silicone replica of a mother’s face. This replica can show facial expressions including smiles and emits soothing sounds such as the mother’s heartbeat and lullabies. By making this pacifier Open Source, the product could be acquired at a low cost and also be sold outside hospitals for use with all babies, meaning it can have a truly positive real-world impact. Shawn Walker is a midwife and PhD student from the Centre for Maternal and Child Health Research in the School of Health Sciences. 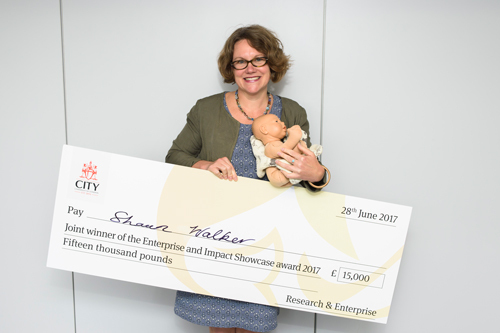 Shawn was also picked as a winner, with her project to improve the skills of healthcare professionals in delivering breech babies. A breech birth is when a baby is positioned bottom-down in the uterus rather than head-down. This position is associated with greater risks, and breech labours and births require attentive skilled care. Innovative techniques to facilitate a successful breech birth exist, however research suggests there is a deficit in the skills and expertise in healthcare professionals to use these techniques. Shawn’s research informed the development of a training course, in collaboration with a researcher in Frankfurt, midwifery lecture and freelance illustrator. Together they have created a leading breech reference text for use in the UK, Europe and beyond. The course has already helped several NHS Trusts to improve their clinical teaching, reaching 100 healthcare professionals each month. It has also been positively evaluated by the Royal College of Midwives. It has potential to be implemented across the NHS and to improve the skills and expertise of thousands of healthcare professionals. Importantly, Shawn's training regime means that breech births can happen successfully and without complications as long as midwives are trained effectively, avoiding the need for caesarian section. Consantino Carlos Reyes Aldasaro and Felipe Piai Vieira from the School of Mathematics, Computer Science and Engineering were runners up and awarded the £1000 mentoring prize. Their project looked into the development of a low cost myoelectric prosthetic forearm. Pete Jones from the School of Health Sciences also received the £1000 mentoring prize. Pete showcased a project to develop a smartphone virtual reality app to simulate vison loss. This year the Research & Enterprise Directorate led a series of talks, workshops and competitions that offered advice, helped academics to secure funding and get exposure for their research. The Enterprise Impact Showcase was the final event of this comprehensive programme, but plans are in development for the next year. For more information visit the research and enterprise website.